Most people around the world view education as a means to a prosperous life. When reliable manufacturing and physical labour jobs were a staple of Western, industrial economies, tertiary education was considered for the elites only. Costs were relatively low, but there was also much less demand. Due to the forces of globalisation and technology (i.e., automation), the university degree has grown increasingly indispensable in the contemporary world, both inside and outside traditionally first-world countries. This explosion in the importance of higher education has predictably generated growth in the demand for such education, and this is part of the driver behind rising education costs. However, wages and income have stagnated or only slowly increased, while the cost of this crucial aspect of life has skyrocketed. How have the world’s students (their parents) reacted to the disparity? By borrowing more and more to fund their educations which ultimately lead to the studend loan debt. You can track all real-time and personalised news (for you!) of student loans on CityFALCON here. According to NCES in the United States, tuition at has risen 55% at public universities to over 16,000 USD in the period from 2005 to 2015. The percentage increase at private universities is about 40% over the same period, settling at 37,000 USD in 2015. A similar story is playing out in the UK, where tuition caps set by Parliament have tripled to 9,000 GBP in a comparable period (not all institutions charge the maximum, of course). Funding for tuition is not the sole cause of rising debt. Costs of living, especially for those attending universities in cities like New York or London, also account for a nontrivial portion of the debt. In countries with free or near-free university attendance fees, such as Sweden, students graduate with an average of 20,000 USD in debt. One notable exception is Germany, where parents are legally obligated to financially provide for students – where the average debt of school-leavers is about 2,500 USD. The amount of outstanding debt has also risen considerably. In the US outstanding student debt has surpassed 1,200,000,000,000 USD (yes, one-point-two trillion US dollars), with the amount more than doubling from 2007-2015. In the UK, the amount is over 100,000,000,000 GBP (one hundred billion pounds sterling), more than doubling from 2011-2017. For comparison, the US hosts about 19 million students per year while the UK hosts about 2.3 million. In the United States, student debt has risen steadily since 2004, even when all other forms of debt tracked by the Federal Reserve have generally been paid down. With other forms of debt seemingly on the rise, the overall household debt will rise. While the countries discussed here are not entirely representative of the global economy, we should not forget that the 2008 Financial Crisis, which caused global economic problems, stemmed from the United States subprime mortgage market. Is the student debt bubble in the United States the next mortgage crisis? 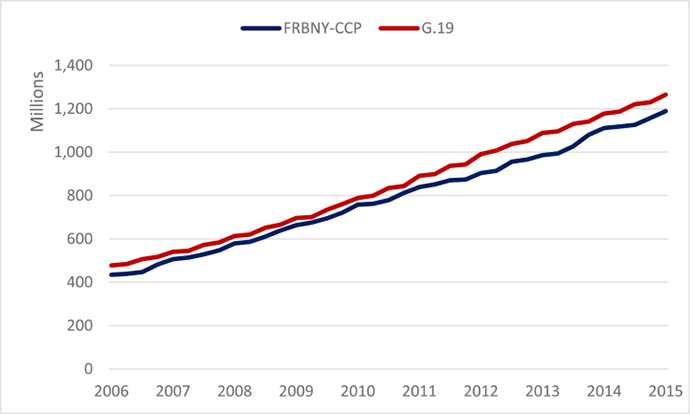 The first indications of an impending crisis are widespread delinquency rates and runaway growth. As of 2007, the student loan delinquency rate in the United States was about 7%, and it has since risen to 10%, according to the AIER. Furthermore, in the United States, there are no protections for borrowers who cannot make their payments. The minimum income threshold for UK students to begin repayment is £21,000, and remaining balances are forgiven after 25 years of payments. In Australia, the minimum is about 54,000 AUD, and the payments are capped at 8% of income. There is a similar situation in Canada, where borrowers must earn 25,000 CAD before repayment kicks in. Unfortunately for American debtors, the repayments tend to start within 6 months of graduation (following a grace period), and while income-based plans are available, which include much higher lifetime amounts of interest, bankruptcy does not absolve these loans. Some programs for forgiveness exists, but they not widespread and require 10 years of service in certain areas. This leads to lifelong struggles with debt for some people, and for many older Americans, debt is also becoming a problem. Whether students are holding debt for longer (subscribing to decades-long repayment plans) or borrowing on behalf of their children (more common), the number of older Americans with student debt has more than quadrupled since 2005. The large majority of student debt holders is young, and this has a two-fold economic effect. First, such people are not stimulating the economy by consuming products or services, but rather servicing their debt. The second consequence is the delaying of savings, investment, and large purchases like homes. Since the waiting period for forgiveness is long, or non-existent, these are several years in which borrowers delay their lives and avoid economic interaction. In countries like the United States, where borrowers cannot erase their debt even in bankruptcy and there is little in the way of debt forgiveness, consumers will bear the ever-growing student debt burden. However, for a country like the UK, where the government does eventually step in (or guarantees the debt, expecting no payments before a minimum income threshold is achieved), the debt burden is largely transferred to the government. According to Office of Budgetary Responsibility, a quarter of UK debt borrowed after 2012 will not be repaid at all. Therefore, governments will be doubly subsidising tertiary education: once while students are attending university, and perhaps again when they default and never repay their loans. For the US, this could come in the form of poverty-level populations qualifying for assistance due to large debt repayment requirements. One interesting perspective regarding the reason behind rising delinquency and default is a strategic delay. With political pressure mounting for reform and aid, some borrowers are betting politicians will eventually wipe away their debt. In that scenario, it would be financially beneficial (albeit irresponsible) to make few or no payments. Every missed payment becomes extra on-hand cash, useful for paying down other debts, consuming services and products, or as savings. During the subprime crisis, borrowers with underwater payments often defaulted, as there was no reason to continue making payments on a negative-equity property. Due to the huge supply held by banks, many people squatted in their own homes while foreclosure procedures took months to complete. This is a dangerous strategy, though, because under current law (at least in the United States), wages, tax returns, and Social Security can be garnished to repay debts – and these debts cannot be erased in bankruptcy or mostly eliminated by collateral liquidation. Hence the aforementioned older Americans, who hold too much student debt to retire and cannot be released from the burden, may end up working longer. This exacerbates any young adult unemployment problems at a time when companies are reducing workforce numbers in favour of automation. While it seems an unassailable argument that higher education improves one’s life, it may not be necessary for national economies. The trend tends to be higher education implies higher GDP, but that is not necessarily the case. One of the most glaring exceptions is Germany: there is low student fee, low cost of attendance, and low levels of tertiary education. The country falls well below the OECD average of young adults with tertiary degrees, but simultaneously boasts envious debt levels and a strong economy. This may partially be attributable to training as opposed to a “college for all” style of education. Perhaps unexpectedly, educating an entire cohort to a high level could place downward pressure on wages for individuals in that cohort, as their degree becomes commodified. In the United States, there is serious speculation that a university degree is becoming the new high school degree and a master’s degree is now needed to differentiate oneself. There is no doubt the United States economy is one of the most resilient, innovative, and well-diversified economies in the world, but elevated debt levels and tertiary degrees for all may not be the only formula for success. Higher education has become mandatory for many of the service jobs available in the modern industrial economy. There are no longer lifelong manufacturing jobs with solid pensions available – indeed, even in the countries where those jobs relocated, automation is rapidly replacing human labourers – and the new jobs require education. As AI advances, perhaps even some of these jobs requiring education will be replaced with computers. If the delinquency rates rise, there may be issues for individual companies. One major difference between the student debt problem and the mortgage crisis is the lack of CDOs and CDSs. The thread that connected banks, governments, individuals and economies were the CDO and CDS. With a complex system of mortgage securitization and insurance against those securities, the system effectively collapsed itself. However, as evidenced in this New York Times article, there are no CDSs to bet against student loans. This means AIG-like companies won’t overextend their risks, which was one of the major shocks of the Financial Crisis. To be certain, student loans make up a large portion of national debts, and whether governments, individuals, or corporations will pay for it, its size and prominence will certainly impact the global economy. It is not absolute that a catastrophic event will pop the bubble or if a slow, grinding deflation is in the future, but large debts for young and old alike, across the globe, will not go unreflected in economic activity. There is a key point missing in this blog: The American Crisis was caused by the removal of bankruptcy protections. 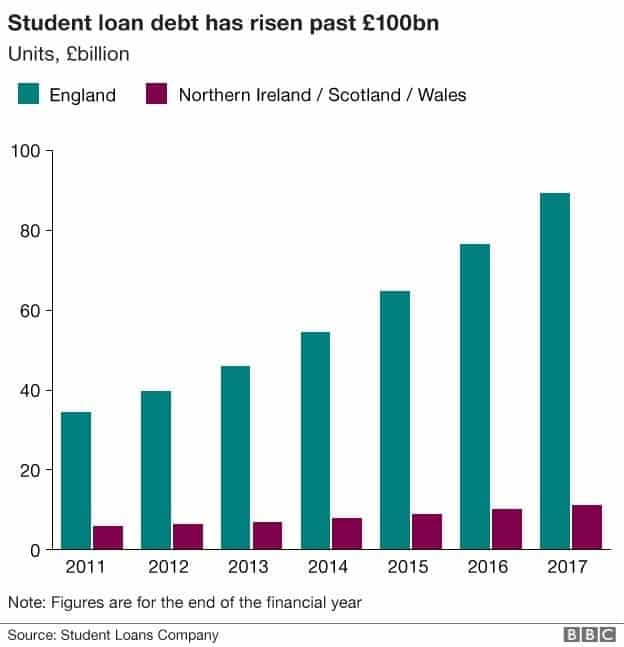 This essentially took all risk out of the debt, and gave the colleges a green light to raise their prices at will, caused the lenders to behave in a vicious, predatory fashion. Today, the banks, the investors, and even our Department of Education fight hard, behind the scenes, to keep bankruptcy rights away from this cash cow. This, despite the fact that our Founders demanded in our Constitution a uniform bankruptcy system many years ago. 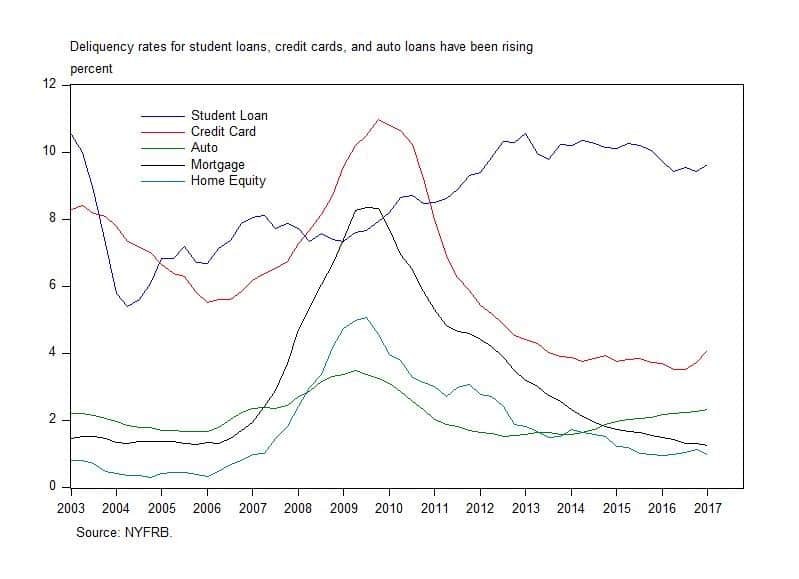 This has been violated uniquely for student loans, and now we are seeing the predatory, hyper-inflationary consequences…all wrapped in the government cloak of legitimacy! People don’t realize that the SAME THING HAPPENED IN THE UK, BUT MORE RECENTLY. Sometime around 2004, bankruptcy rights for UK student loans was restricted severely. So…what happened in America is due to happen in Britain! We are already seeing an explosion in college prices there, and also a huge rise in debt. I have tried to warn the Brits about this for years. So far to no avail. This all starts with the removal of bankruptcy protections. I hope the Brits will see the catastrophe in the US, get smart about it, and fight back while there is still time. I would not wish what happened here on any other country, but Britain is poised to fall, just like we have!!! The bubble burst in Education Loan is a very thought-provoking. It is very insightful. There are several federal and private lenders that “award” loans to college students and the student loan crisis (yes, it is a crisis when we have a 1.48 trillion dollar student loan problem) is only getting worse. Just look at the history of student loans and how the debt has worsened year after year. Lenders are giving college students thousands of dollars in student loans yet we have a history of debt that keeps getting bigger. 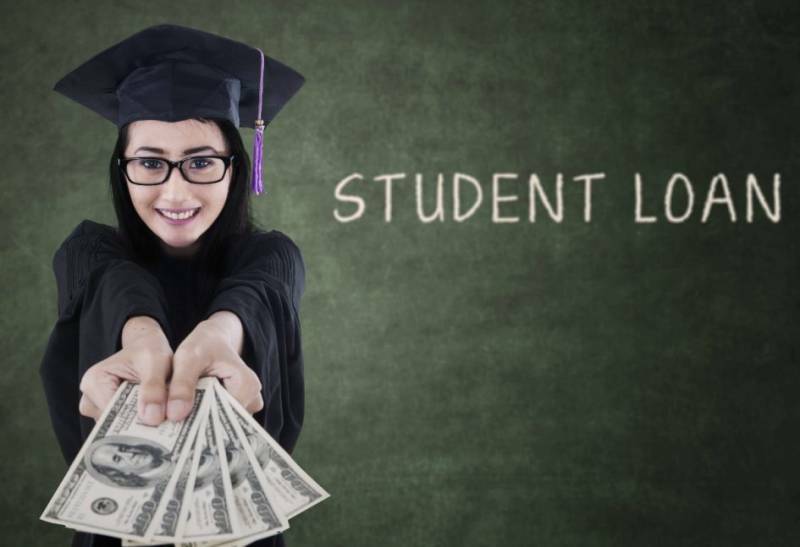 Do lenders like Navient, Great Lakes, Nelnet and so many others realize that they are giving tons of money out to students year after year but if they look back at the history of student loans they will see that their system of lending is broke. For years students have been getting into debt, the student debt keeps growing, tuition keeps going up. some school is always wanting to build some building, people are going into default, they are going into delinquency. Don’t lenders see this? You bet they do. So, why do they keep lending loads of money if all they are really doing is ruining lives financially and their annual lending continues to contribute to a crisis year after year? Why do they keep lending if their system is broke and flawed? How can lenders give an 18, 19, or 20 year old thousands of dollars in loans without doing a credit check or checking job histories? Some people who have been working years can’t even go down to their local bank and get a loan for $5 but lenders can give out thousands of dollars in student loans without doing one credit check. How is this possible? Lenders and colleges/universities should be ashamed of themselves! What a tragedy!